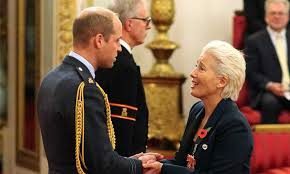 The 59-year old Oscar winner received one of Britain’s highest awards from Prince William and says she thought about giving him a kiss at Buckingham Palace. Her Dame-hood comes in recognition of an outstanding career that includes being a screenwriter, activist, author and comedienne. Thompson is known for her portrayals of enigmatic women, often in period dramas and literary adaptations and playing matronly characters with a sense of wit. Dame Emma has received two Academy Awards, a Prime-time Emmy Award, three BAFTA Awards and two Golden Globes.